I am a Maker, mostly crochet and some sewing. I love textile and fiber arts. And I am a non fiction writer. I have started a new crochet project. I’m using a more bulky yarn that I’ve used before, but it is crocheting up nicely. A sneak peak of work so far. Can you guess what it is? No, it’s not a rug, or a giant coaster. So long as it works out, it’s going to be a bag! The pattern called for 10 ply yarn and a 4mm hook. Unfortunately I wasn’t buying at my usual yarn shop – The Crafty Frog – where I get lovely helpful service. So, in this other shop I couldn’t find anything labelled as 10 ply, and when I asked I was told some yarn companies are moving away from putting the ply on their labels. The shop assistant suggested I use the tension square markings on the labels to work it out. So I had to guess whether the yarn was right by finding one yarn labelled as 8 ply and another one labelled 12 ply and then comparing the tension square markings. I then found some yarn where the tension square seemed to be somewhere in between and decided to call it 10 ply! Pretty scientific right? Once I got the yarn home I tried a couple of hook sizes and settled on a 4.5mm one. A 4mm may have been slightly better in terms of giving me a tighter stitch, but I just felt the 4.5mm was a bit better to manage the thickness of the yarn. I’m thinking of lining the bag with fabric in the end. So, that should mean any openness of the stitches is less of a concern. And hopefully the bag will also hold its shape better when it ultimately gets filled with an assortment of stuff. I’ll report further on this project when it is more advanced. If I am going to make money from craft I am going to have to figure out some revenue streams. The most obvious place to start is to begin selling some finished products I’ve made. The obvious places to do this include markets and craft fairs, selling on consignment, selling items wholesale to a retailer and selling online. I have decided to focus on the online option for the moment. This is mainly because I have plenty of calls on my time with a family and a day job. The hours required to have a market stall seems too difficult at the moment. Also, I would need a lot of stock all at once for a market stall. Selling on consignment or wholesale may also be good early strategies, but I need to sequence my efforts – so online it will be to begin with. Apart from the fact that I can build it up gradually, online selling also appeals because the sales can happen while I am doing other things. I can produce and upload products for sale at times that work around my other commitments. However, on the downside I know selling online will likely result in a slower start and it may take quite a while to build any momentum. But this is something I will just be aware of. In the online world there are various sale options. But I will start with Etsy. Etsy is big and well established. I’ve heard of it and so have many other people. I know there are other similar sites – examples includehandmade.com.au, Hardtofind.com.au, Madeit.com.au, Bigcartel. But the (little) research I’ve done seems to suggest people have the best experience with Etsy. I may explore some other online options down the track once I am comfortable with using Etsy, but for the moment I will concentrate on one thing at a time. And for the moment Etsy will be that one thing. Facebook will probably be a close second. I’m familiar with Facebook as a regular user, so I’m halfway there. But I am seeing other crafters making successful sales through Facebook, so I think I’d like to give that a go too. I have registered a store on Etsy and am half-way through the set-up process. When it is fully operational with at least one actual product in it I will do the big reveal and tell you the name of my shop. I have dabbled in craft activities since I was a child. My clear preference though is textiles. I have never been confident with drawing or painting. And I have never been particularly interested in these mediums. Neither is sculpture my thing. I’ve had some fun with ceramics in the past – but could never master anything other than very lopsided pots. Controlling that clay on the wheel has never been my forte! For me, sewing, knitting and crochet have always been my thing. With the occasional bit of needlework thrown in. My mother taught me how to sew clothes. And when I was a young adult I made many of my own clothes – including components of my corporate wardrobe. I also married in a dress and veil I’d made myself, with my bridesmaid sister wearing a complementary dress sewn by my mother. As a child I learned to hand sew and can remember making stuffed felt toys and completing simple cross-stitch patterns. When I was a bit older I completed a patchwork and quilting course, learning the basics of piecing and hand quilting. I resumed quilting as an adult, around about the time I was pregnant with my first child. Over the years I’ve made some cushions, wall-hangings and a few quilts. My mother also taught me to knit as a teenager. I produced quite a few jumpers and a hat for myself. 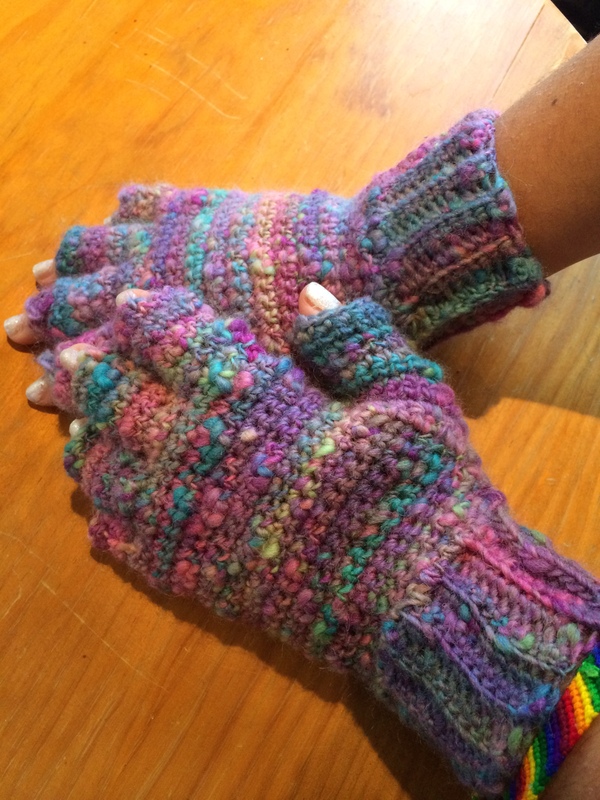 I also remember knitting gloves for others. I am sure I must have made scarves as well. Who learns to knit without practicing on the odd scarf? I haven’t knitted so much in recent years – particularly as I carry a permanent wrist injury from too much computer use at work. Unfortunately knitting and this injury are not very compatible. My grandmother was a crochet addict. As far back as I can remember she was always a maker. I know she made other things as well – like a lovely cloth doll with a beautifully decorated carry basket (made with a shoebox under all the lovely frills and mattress!). This was a gift for me as a two-year-old on the occasion of the birth of my first younger sibling. But despite this memory I know her thing was really crochet. Growing up, my siblings and I were gifted with many of Nana’s creations over the years. As were all other members of her family. My other grandmother also crocheted. I remember her producing very fine lace work. And I have a beautiful table cloth she made this way. Just this year I have had the urge to take up crochet again. I say again because I had a vague memory of how to do it. I must have learned it long ago, but the skills lay dormant. For months now I have been experimenting with different patterns and learning new stitches. It’s like I am suddenly channelling my grandmothers! Luckily the action of crochet is easier on my injury than knitting is. I’ve produced a hat, several pairs of gloves, several scarves, and a series of toys. I also made a very poor mobile phone pouch (an attempt at my own design) and some place mats. 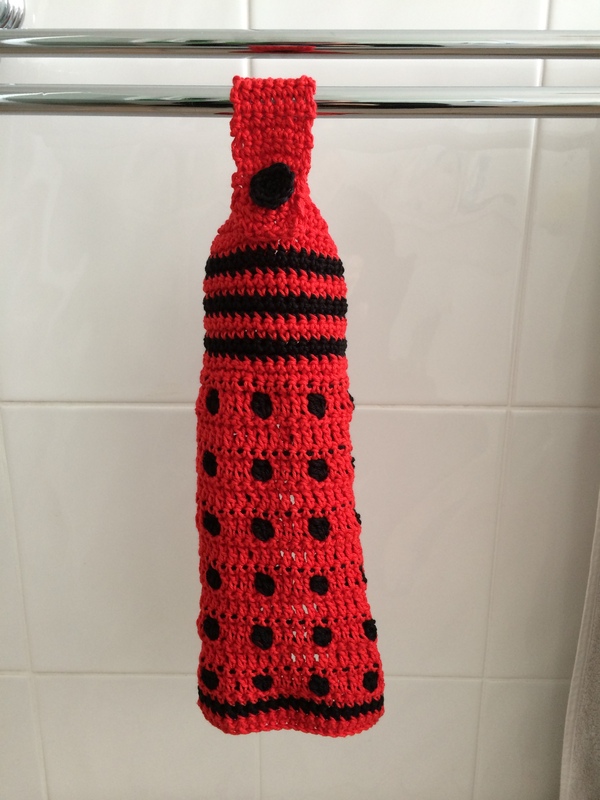 I’ve experimented with making flowers and ornaments, and – for all you Dr Who fans – a towel that looks like a Dalek. 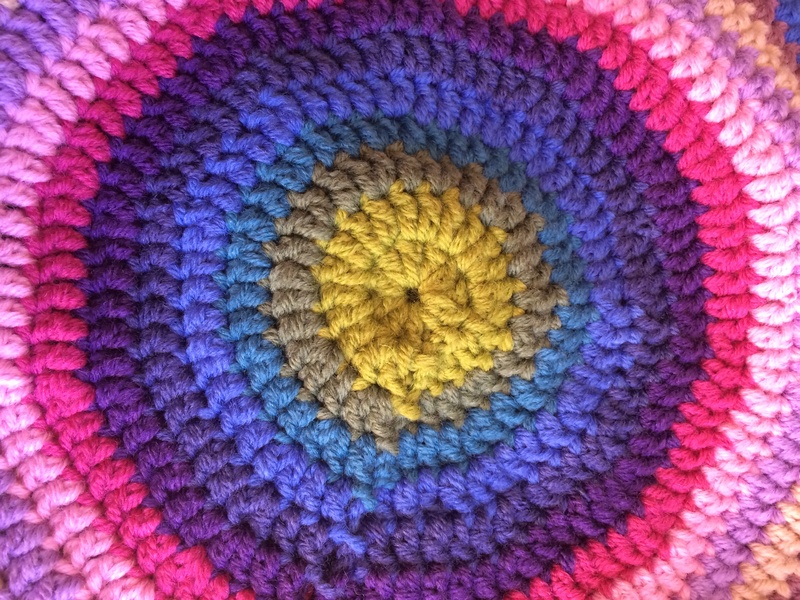 Right now crochet is one thing I’m really drawn to doing. So, while my focus changes, between crochet, dressmaking, knitting and quilting and so on, I am at heart a textile crafter and maker.